This year we decided to experiment with raising turkeys. We got the turkeys bred specifically for meat. They grow fast, eat a lot, have AMAZING personalities, are lovable, and ---well, can you tell I have become attached? We didn't actually PLAN to raise turkeys for meat...in fact, we were ignorant about the fact that there are HUGE differences between meat turkeys and heritage turkeys. You can read more about that in this article, Seven Things We Learned About Turkeys This Year. Having an egg-bound hen is a tragedy, unless you catch it early on. We had an egg-bound incident, and here is how we had to handle it. FTC Disclosure: There are affiliate links (mainly to Amazon) in this article. If you happen to click through and make any type of purchase, I may earn a very small commission at no extra cost to you! We were so excited when our turkey hens (not so little anymore) began to lay eggs! One of them in particular, began to give us an egg about every other day. Then---the eggs just stopped coming. We didn't think much of it, because we are new to turkeys, and I had returned to the classroom to teach for the school year---in other words, I was SUPER busy at that time. Here is Little Mama as a baby. Turkeys are wonderful animals, and she was especially sweet. So when my husband and I visited our flock (like we do at least once a day and usually more often) to feed and gather eggs this Saturday evening, we noticed that little Mama was not looking very well. Here is Little Mama. This day, she was following me around the homestead, watching me garden. 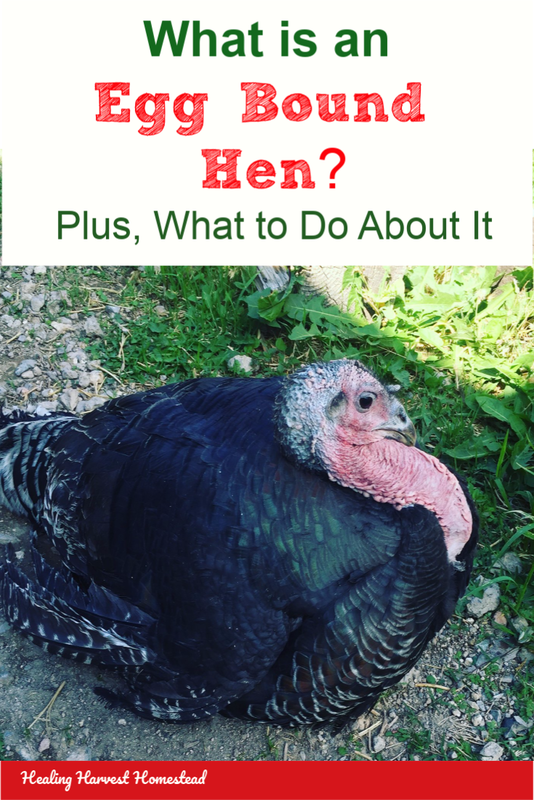 What is an Egg-Bound Hen? Not having experienced or even heard of the phenomenon of "egg-bound hen," I sure learned fast. I googled her symptoms, and this is what we discovered was the problem. I wish I had known sooner, and had known what to look for. The thing is, except for not laying eggs on schedule, she had been acting ok up to that day. This was the first we had seen her acting strangely---very very sick actually. Hens are continually creating eggs, and in the process, there are eggs inside the hen at various stages of development in the process of being laid. If a hen becomes "egg-bound," it's exactly how it sounds. The hen is unable to pass an egg for some reason, but the other eggs behind it keep on developing. If an egg breaks inside of the hen, it can be disastrous--as in the case of our Mama. Well, we debated about trying some of the remedies, which include things like warm water bath soaks, abdominal massage, putting on a latex glove with some olive oil and trying to remove the egg...etc. Honestly, she was just too far gone at that point. We decided to harvest her. My husband handles the harvesting of creatures aspect of our homesteading life. I still cannot bring myself even to watch. I know it's necessary and it's what the animals are for, but I have to admit I do still have trouble with it sometimes. My dad was a hunter, and so is my husband. I understand that animals serve a purpose on this earth to feed us. I also believe that this should be done with care and humanity, which we do. I'm sure that eventually I'll be able to participate better than I do now. In fact, at some point, I'll have to. So you really can understand how badly she was doing (she would probably have died that night, and we would have been picking up a dead hen in the morning that had suffered greatly), here is a bit of what my husband found when he dressed her. There were several backed up eggs of various sizes from large to smaller and smaller. In addition, there was one very rock-hard mass right at the opening of her vent. There is no way she could have passed it. It was probably a combination of two or more undeveloped eggs together. I am just glad that she didn't have to suffer any more than she had already. What I'm also really sad about is that I was really hoping to keep her as a layer. Plus, like I said, I had gotten quite attached to her. She would even walk into our bedroom if I left the door to the yard open. Little Mama was a real sweetie. 1) They must be nice---we don't tolerate any mean animals. It's not worth the stress to us and to the other creatures. 2) They must serve some kind of purpose besides being simple pets. We just don't have the finances or the time to keep little fluffy animals without them being productive here. That may sound harsh, but it is a rule we developed after dealing with a couple of different issues over the past three years. Little Mama was eventually meant to be a meat bird, just as the other turkeys are. I was just hoping that her laying would pan out for all of us, and we could keep her long term. This was unlikely anyway, and this just hastened the end---plus we learned a valuable lesson about what "egg-bound" is and means---plus what to do if you can catch it early enough. Little Mama ended up living a short but wonderful life. She was happy, loved, and healthy. When she ended up with the condition of being egg-bound, it was just her time. We loved her, and she served her God given purpose on our little homestead. Am I Sad? Absolutely, I Am! But I also truly believe in raising animals right, treating them well, and allowing them to do their job. I whole-heartedly believe that people have become so far-removed from their food supply that there is absolutely no empathy across the general public for humane treatment of animals. Hence---the success of the disgusting, inhumane, filthy factory farms. I feel no guilt at all when I compare our animals' wonderful lives here to what those poor factory farm abused animals must endure. People may think we are "cruel," but truly, I believe we are the ones with humanity and love for the gifts that God has given us, and our animals, though loved well by us, are serving their purpose. They live a beautiful life, free ranging with our other animals, and this is how it should be. Below are some documentaries that may help you understand our point of view. They were instrumental in our growth and journey into our small homesteading life. Food, Inc., especially is a great place to begin learning about the American food system. Fast Food Nation is another great one, among the many others out there! If you're like us, once you start investigating where your food actually comes from, it will change your entire perspective about how you eat! 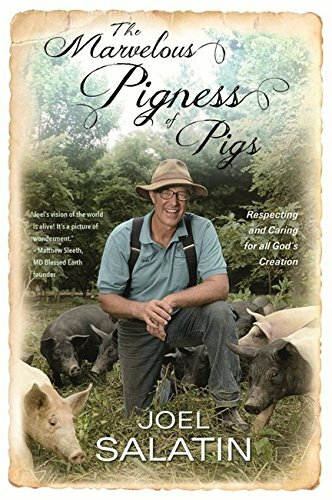 Have you looked at or read any great books about our food system lately? What's your favorite? We are always looking for more information here, on our homestead! I'd love to hear from you! Can a Turkey Hatch a Duck? Hugs, Health, & Self-Reliance---and to a Peaceful Happy Life! P.S. Don't forget to sign up for the Newsletter! You'll receive my free eBook on How to Use Herbs to Relax when you do! :-) You'll love it! You’ll also get access to the FREE Resource Library where you’ll find your free eBook above, along with lots of other short books, guides, cheat sheets, checklists, and more to help you on your journey to self-reliance! Jan 23 Can a Turkey Hatch a Duck?